This story has rapidly made the rounds in the blogosphere, and it is indeed a big deal. One of the most significant economics papers underlying the argument for why high government debt (especially over 90% of gross domestic product) is bad for growth was published in 2010 by Carmen Reinhart and Kenneth Rogoff, “Growth in a Time of Debt” (ungated version here). As Paul Krugman (link above) argues, what we are likely seeing is reverse causation: slow growth leads to high debt/GDP ratios. That is certainly what EU countries are finding as they implement austerity measures and slip back into recession. But even if high debt/GDP did cause slower growth, we can see it is nowhere near the crash that Reinhart and Rogoff’s paper made it out to be. The ‘gaps’ are explained by the fact there were still gaps in our public debt data set at the time of the paper. Our approach has been followed in many other settings where one does not want to overly weight a small number of countries that may have their own peculiarities. This is a very odd response from two authors who equated one year of New Zealand to 19 years of the far larger UK economy. Worse still when you add the fact that by excluding several years when New Zealand had a debt/GDP ratio over 90%, they got an “average” (actually only one year) growth rate of -7.6%, when the correct average, with all relevant years over 90% included, was 2.58%, a 10.18 point swing! It’s obvious that the austerity crowd is still going to defend this paper, but that doesn’t mean anyone else should be taken in by them. I posted all I can say publicly at Skippy. And even that wouldn’t work at a family blog like this one. The Phantom Scribbler came out of her retirement (first post in more than eleven months), though, so you should Go Read Her. would you (a) immediately start talking about the “clear lack of growth”? or (b) even more immediately say, “There must be an outlier in the data. What’s the kurtosis? I don’t believe I know anyone who would do (a). If I were teaching Econ 301 and someone presented R&R’s data–see the Konczal link above–and came to their conclusion, they would be lucky to be told to do the assignment over. *What’s the difference between a bond and a bond trader? A bond matures. A couple of questions go unasked and, of course, unanswered by Professor Piestein. What would Locke say? I’ll not waste your time with a pile of extraneous exegesis and superfluous hermeneutics. Number VIII of Locke’s Essays on the Law of Nature was titled, “Is Every Man’s Own Interest the Basis of the Law of Nature? No.” Number VIII was the source for several of the arguments in Chapter Five, “Of Property,” in Locke’s Second Treatise on Civil Government. What part of the word “no” did Professor Piestein not understand? Saving, Investment, and Lending in the Real Economy (Graphs). S=I? Update: The signs were reversed for lending/borrowing. Graphs corrected and updated. This is all from the Fed FFAs. 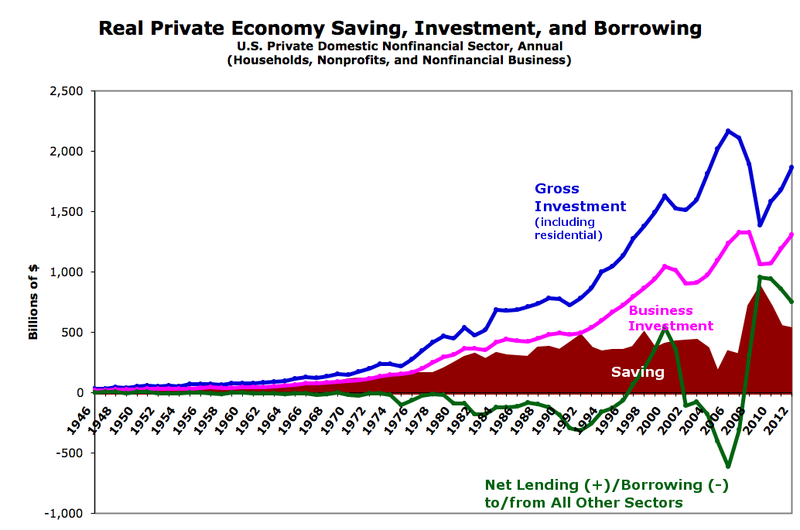 Saving is household/nonprofit net saving (after-tax/transfer income minus expenditures) + undistributed business profits (after-tax/transfer income minus expenditures and distributed profits [distributed profits are part of household income]). Details/spreadsheet on request. I’ve actually written at least three (long) posts on this in course of building out these graphs, but now that the graphs are complete I find myself fairly flummoxed. Saving seems to always be wildly insufficient to fund investment (and no, lending/borrowing + saving has no relationship either). S=I seems to provide exactly zero illumination here. And the post-1990 lending/borrowing swings I see don’t fit with any real-sector saving/dissaving story I’ve heard (or can remember). 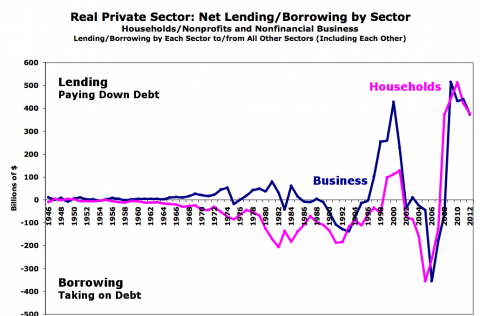 We see borrowing spike during the internet boom, dive following the bust, then spike again during the real-estate bust. ? So I’m going to leave this open to my gentle readers for the moment. What in the heck is going on here? What story (or stories) would you tell to explain what you see? If anyone wants to see earlier periods zoomed in to get a better feel what’s going on, let me know. I’m thinking 1946-1975 (to see what seems like a period of consistency), and 1970-1990 (from the fall of Bretton Woods to the start of the internet bubble and the Clinton surplus). Lifted from comments: Program sustainability is? I tend to think of it in an environmental context, but apparently it is used more broadly. STR, well in Social Security lingo ‘sustainable’ is mostly used in a hyper-specialized way. So to the extent that SS policy has injected the word into discourse it might not be fully representative. I’ll think about it. Operationally ‘sustainable solvency’ for SS means not just being solvent (as defined) over the projection period (there 75 years) but having the metric of solvency (in this case Trust Fund ratio) trending up at the end of the period and so likely to be longer-term or permanent. Rhetorically it is an argument against ‘patching up’ a problem or as the Fix the Debt people put it in their messaging “Kicking the Can (Down the Road)”. If the need is permanent so too should be the structure that provides it, come what may there will be some need to provide transit of goods and people from San Francisco to Oakland as long as those cities exist. Showing that both BART and the new Bay Bridge will proper maintenance will suffice for 35 years is not good enough, long range planners need to think about year 36 and year 50. Now whether given all the uncertainties in the specific case of Social Security we should be worrying about years 76-100 (sustainable solvency) or all years to Heat Death of the Sun (unfunded liability over the Infinite Future Horizon), that is whether this is just reasonable prudence or pointless crisis-mongering to ‘sustain’ a ‘current’ ‘crisis’, is an open question. For example the current funding ‘crisis’ in the Post Office forcing shutdown in Saturday delivery is the result of a requirement to pre fund retiree health care for 75 years, or for the new hires of 2053. I am not really aware of ‘sustainable’ being deployed in that many other policy areas, then again I have a certain amount of tunnel vision on this topic. So to the degree that SS has actually been the source of injection of this term into political discourse it’s precise usage may not be illuminating to your overall question. How high does senior poverty have to go? It’s official: President Obama has proposed cutting Social Security by replacing the program’s current inflation adjustment with the stingier “chained” Consumer Price Index. As I’ve discussed before, this risks undoing all the progress made against senior poverty since the passage of Medicare and Medicaid in 1965. 25% of seniors were poor according to official poverty line in 1968, compared to just 9.4% in 2006. Note, however, that the Supplemental Poverty Measure, which includes things like out of pocket health care expenses which hit seniors disproportionately, already shows a 16.1% rate by 2009. And our senior poverty rate, measured by the international standard of 50% of median income, is already 25%, much higher than most developed countries, more than three times Sweden’s rate and over four times as high as Canada. We’ve seen this game before. The Heritage Foundation’s health care plan became “death panels” when President Obama endorsed it. And, as Beutler’s title makes clear, we have plenty of examples of the President negotiating with himself to bad effect, most notably in the 2011 debt ceiling battle. If this cut really happens, Social Security benefits will steadily fall in true inflation-adjusted terms due to the magic of compounding. Moreover, with 49% of the workforce having no retirement plan at work and another 31% with only a grossly inadequate 401(k), the cuts will worsen the coming retirement crisis. The only question will then be: how high will senior poverty have to go before we do something about it? Obama’s budget isn’t even released yet and he’s already caving to the “let’s make the rich richer and forget the rest” crowd. That crowd that claims that we need a capital gains preference so the rich can gather all that extra money to purportedly create jobs. The crowd, that is, that fails to acknowledge that the rich tend to take all that extra money to Singapore, the Bahamas, or the Cayman Islands or hide it away in some Swiss bank, none of which does any good for our economy compared to what the government investing that money in infrastructure projects would do. See, e.g., David Leigh, Leaks reveal secrets of the rich who hide cash offshore, The Guardian (Apr. 3, 2013); The corporatist crowd that refuses to admit the empirical evidence that says government investment is as important as private investment in creating jobs. It is the government that makes the market go round. And government money–our money–spent for schools, bridges, safer communities provides jobs and improves lives. Without that government investment, there is no market, just barter. President Obama seems to have forgotten that he was elected. as a Democrat, over the Republican candidate. Obama has no business proposing cuts to Social Security benefits as part of a purported deficit reduction package. Social Security is not a deficit driver: it is a social insurance program earned by those who receive it by payments over lifetimes of hard work. It is the only stable retirement income most have. The average Social Security beneficiary receives just short of $14,000 a year from Social Security–that’s just 125% of the poverty line, which of course is defined so low as to guarantee that anyone living at or below that line is indeed in abject poverty and unable to move out of it. The Republican Party has argued for cuts to Social Security benefits for decades, using whatever crisis of the momen they can engender to argue that we can’t afford the system in place. They’ve invented the perjorative term “entitlement” to imply that those who rely on social insurance because of disabilities or old age are just ‘freeloaders’ who are mooching off others. Not so, since Social Security is an earned benefit program like insurance: workers pay premiums throughout their working life, and then once they reach retirement age they may draw benefits. There are a number of reasons for the amount of debt that the US government has–most of them related to the four-decade-long drive by the Republican Party to protect the wealthy and the corporations they own from much of a tax burden and to allow the accumulation of immense wealth by a few at the top of the income distribution. Outsize military expenditures driven by Bush’s preemptive wars undertaken at the same time that the Bush Administration pushed through tax cuts that favored the rich are of course a big problem. The Bush tax cuts threw us from surplus to deficit and we haven’t gotten beyond them yet. The almost complete capture of the financial regulatory agencies by Wall Street, and the resulting financial crisis driven by casino capitalism spiked with the heady bubbles of derivative inflation is of course another part of the problem, and we haven’t gotten beyond that yet, as Big Banks still exercise far too much power over their own regulation, proven by the LIBOR scandal that demonstrated their ability to manipulate the purportedly objective market rate to suit their profit machines. The average Social Security benefit is just under $14,000: the use of chained CPI will result in a loss to the average recipient of “$4,631 in Social Security benefits by age 75, $13,910 by age 85; and $28,004 by age 95″ (from release by Social Security Works, based on “Inflation Indexation in Major Federal Benefit Programs: Impact of the Chained CPI,” Alison Shelton, AARP Public Policy Institute, March 2013. ).